We have sold out three printings, and are 32 days into 2019, so we’re not planning on going back to press. Our 2019 calendar celebrates the legacy of great strikes, from the Seattle and Winnipeg general strikes of 100 years ago to last year’s teachers’ strikes which gave renewed hope to labor activists (and to parents and children) after decades of defeat and retreat. 14 photos, and more than a thousand notes. Published annually since 1985. This 11-by-17 wall calendar features a scene from rail labor history each month plus more than 150 historic dates of significance to railroad workers over the last century and a half of struggle. $15 each, free shipping. Our 2018 calendar celebrates the legacy of workers’ struggles against fascism and bigotry, from the 19th century labor activists who demanded an immediate end to chattel slavery and discrimination against women to the industrial unions that toppled apartheid in South Africa. 14 photos, and more than a thousand notes. Published annually since 1985. This year we look back 100 years, to the Bisbee deportation when some 2,000 miners and their supporters were forced into manure-coated cattle cars and hauled by rail into the desert, where federal troops prevented them from returning to their homes. Those workers had organized into the Industrial Workers of the World after their previous union had proven too friendly with the employers. Among their demands was to equalize wages for the predominantly Mexican-American workers who handled the ore above ground for half the pay. That same year, federal officials raided union offices across the country, unleashing a reign of terror on dissidents and radicals and workers who saw no reason why they should be asked to work in dangerous conditions for low pay while their bosses reaped huge profits from World War I. It was a time of fierce repression, but also a time when workers were organizing across the racial and ethnic lines that had historically divided them. They were seeking better pay and working conditions, but also shorter hours and a new society in which workers could live in dignity and freedom. And those struggles have continued unabated over the century that followed. This year’s calendar looks to Venetian gondoliers, who struck for safer work but also to save their city’s history; to teachers in Oaxaca shot down for defending their union and their schools; to Detroit teachers who struck for decent schools; to a time when Arab and Jewish workers could march together on May Day, hoping for a society that would respect the rights of all. We remember the vicious repression that has been visited against our fellow workers, but also the solidarity of millions that spared Tom Mooney’s and Warren Billings’ life, and the recognition that an injury to one is an injury to all that led Canadian postal workers to strike to end the consignment of women postal workers to second-class status at half pay. We invite you to remember these struggles, and to reflect on the possibilities for reviving a labor movement committed to solidarity, and to a vision of justice and workplace democracy. 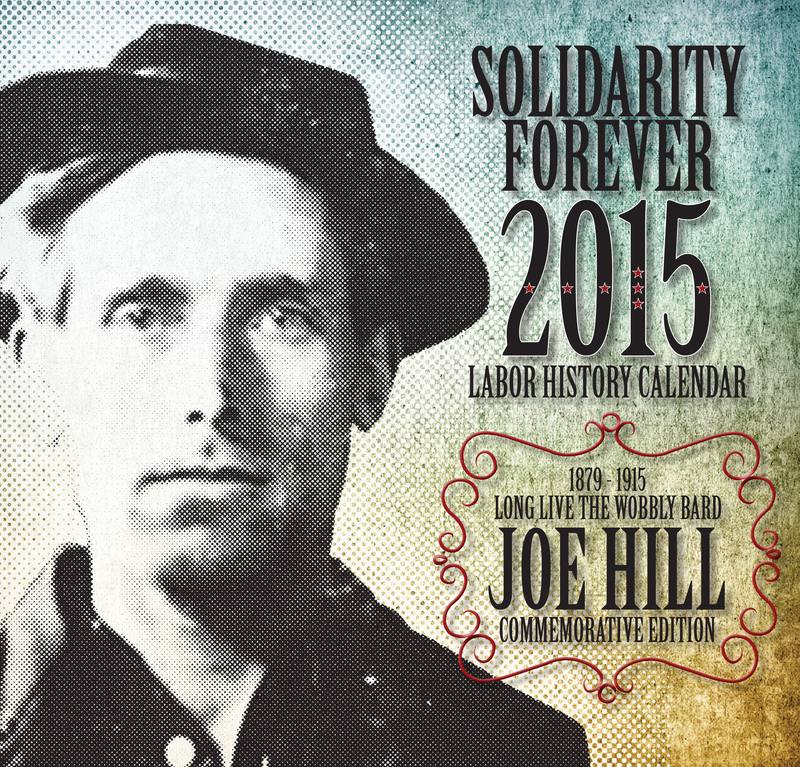 Get your labor history calendar(s) today. Every wage slave needs one! 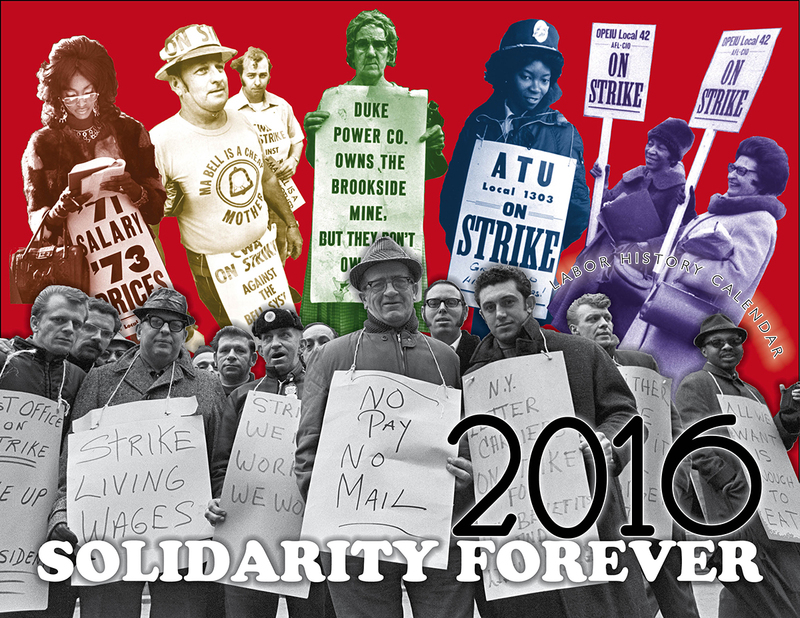 Our 2016 calendar looks back five decades, to an era when Australian construction workers acted in solidarity with environmentalists and women’s rights campaigners, when U.S. postal workers won the right to meaningful collective bargaining through a national wildcat strike, when farmworkers seemed on the verge of winning union conditions and representation for the first time since the IWW’s agricultural organizing in the 1910s and 1920s. We invite you to remember those struggles, and to reflect on the possibilities for reviving a labor movement committed to solidarity, and to a vision of justice and workplace democracy. The 2016 calendar returns to our normal 11 by 17 inch (open, folds to 8 1/2 by 11) format, with color cover and black and white insides. It features 16 photographs from Australia, England and the United States. The calendar sells for $12 ($6.50 each for 5 or more to the same address). Published by the IWW Hungarian Literature Fund in cooperation with the Greater Kansas City General Membership Branch of the IWW, and printed by union labor. The 2016 calendar is out of print, and we can not fill additional orders. Great for fundraising, workplace walls and gifts. Every wage slave needs one! The 2014 Calendar’s theme is low-wage workers’ organizing, with 13 photos covering struggles from 1909 to 2013, including a protest march by Bangladeshi garment workers days after the largest industrial “accident” in that industry’s sordid history. Several new notes commemorate important dates in labor history from around the world, and an essay reflects on recent struggles by low-wage workers for safer conditions and a living wage. The calendar is union printed, bearing both the IWW and the Allied Printing Trades bugs. The 2014 calendar was published in cooperation with the Greater Kansas City General Membership Branch of the Industrial Workers of the World. 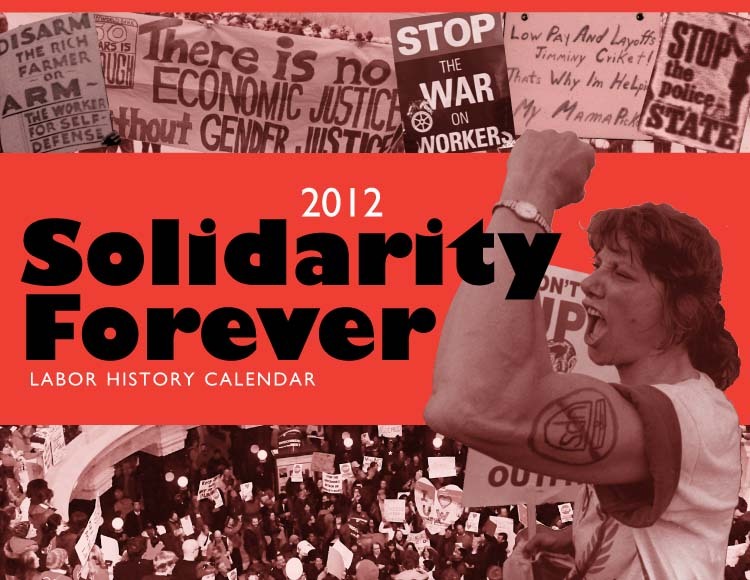 The 1985 – 2018 Solidarity Forever Labor History Calendars are out of print. Why does a radical labour calendar (2013) Contain X-ian, Jewish, Pagan and other dates I do not recognize. Surely religion and superstition have little to do with IWW thinking. N’est-ce pas? Many workers (including many radical workers) hold religious beliefs or work with people who do and so need to be able to take these into account. There is nothing in the IWW Preamble or program that calls on workers to embrace or reject religious beliefs. The calendar also includes a number of government holidays, notes about Daylight Savings Time, etc., which we include not because we necessary believe these holidays are of particular relevance to workers’ struggles, but because we endeavor to provide a calendar that is useful as well as educational/inspirational. I would go nuts without my annual labor history calendar from IWWHLF, to which I was introduced by the late Fred Lee. I am a classically trained economist, but having received my degree at age 58 I never drank the Kool Aid. By the time I got my “union card” I was already awash in heterodox and radical economics. Still am, still learning, and aiming (now that I am retired) to continue teaching outside the academy. 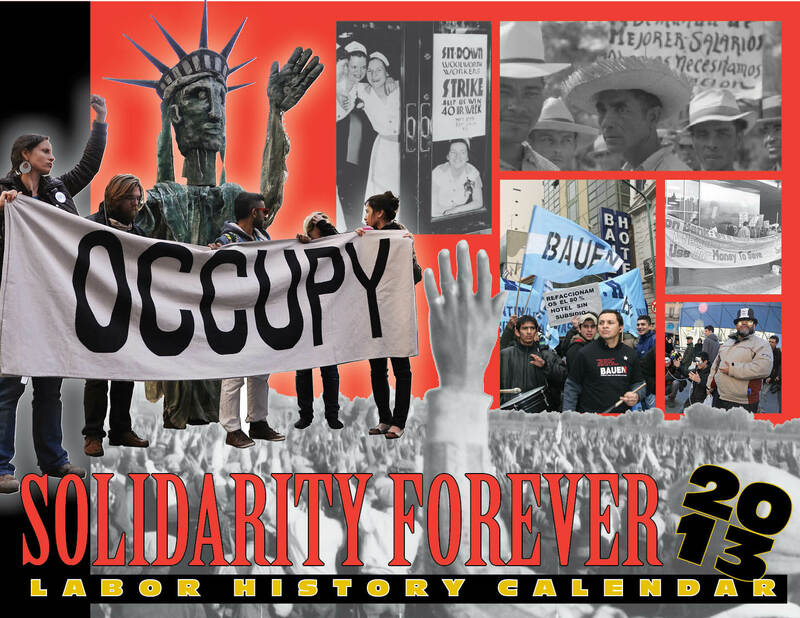 How do I order the 2018 Solidarity Forever Labor History Calendars? I can’t find a link or an address!